Cornelius Vanderbilt started on the path to fortune in the decades before the Civil War. As a young man, he went to work for other people as a ship's captain and then became a business manager. He started his own shipping company in the 1830s. At that time, New York City was growing very rapidly. Vanderbilt knew this meant there would be a growing need for affordable and reliable transportation. Vanderbilt's company carried passengers, farm products, and manufactured goods throughout the New York City, New Jersey, and Connecticut area. The drawing below shows the city as it looked in 1856. Notice that the bridges that exist today did not exist then. Crossing the water meant going on a ship or boat. Click here for a larger view of this drawing. Cornelius Vanderbilt is best known today for building up, improving, and extending the New York Central Railroad. By the time he died in 1877, the company's rail lines connected New York with cities as far away as Chicago and St. Louis. Vanderbilt's success was a good lesson for all of America's businesses in those years: Lower your costs, serve the customer well, and think big! 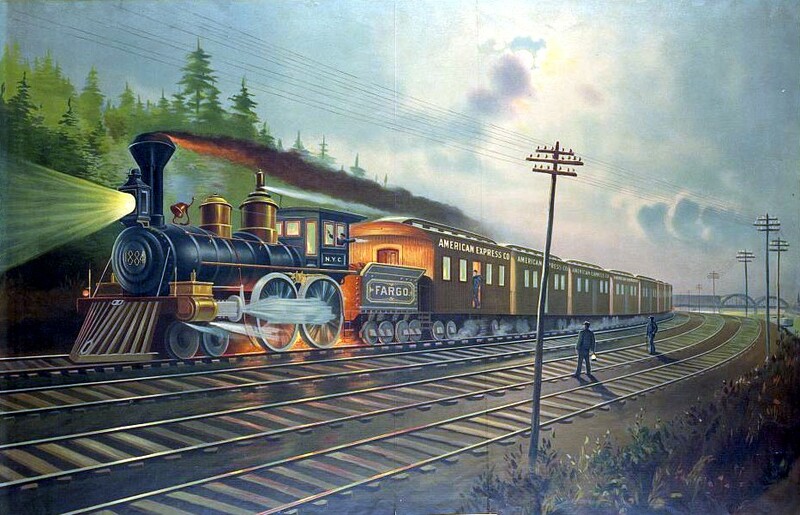 The painting below shows a train on the New York Central Railroad in 1884. Notice that there are four sets of tracks - two in each direction. That way both fast and slower trains could easily be run in both directions. Grand Central Terminal in New York City was opened in 1913 to replace the old terminal Vanderbilt had constructed there for his railroad system. It is one of America's most famous landmarks, with millions of people passing through its main hall each year. A statue of Cornelius Vanderbilt stands outside the terminal in his honor. Photos and drawings are from the Library of Congress. Some images have been edited or resized for this page. Copyright 2009, 2012 by David Burns. All rights reserved. As a guide to the Virginia Standards of Learning, some pages necessarily include phrases or sentences from that document, which is available online from the Virginia Department of Education. The author's copyright extends to the original text and graphics, unique design and layout, and related material.